Danville, KY (April 10, 2018) – The United States Department of Treasury yesterday certified the census tract encompassing the downtown Danville business district as one of 144 Opportunity Zones in 84 counties in Kentucky. 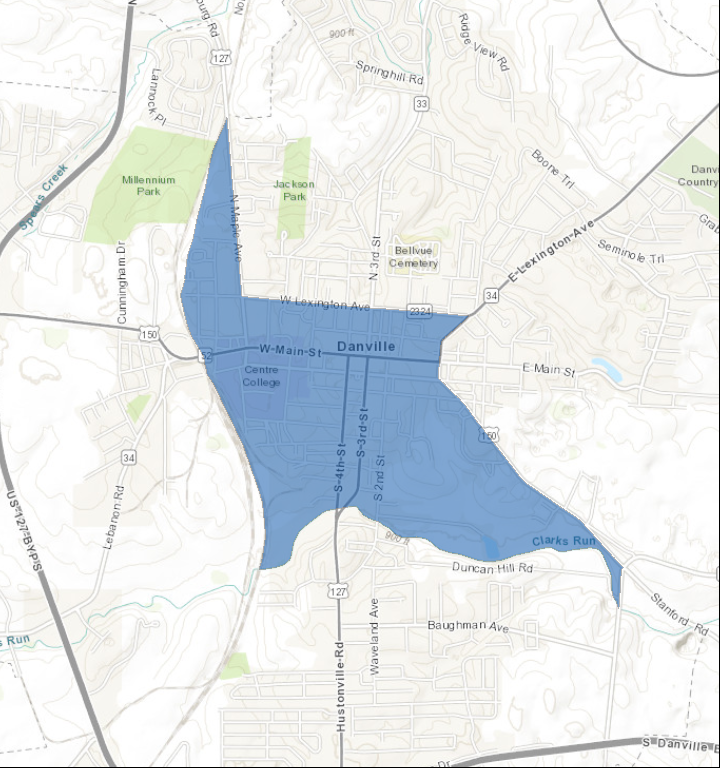 The Danville census tract was among those nominated by Governor Matt Bevin for designation as Opportunity Zones. On behalf of Boyle County and the Cities of Danville and Junction City, the Danville-Boyle County Economic Development Partnership submitted a joint proposal on February 26 for four (4) contiguous and eligible census tracts within Boyle County including each jurisdiction to be considered as one Opportunity Zone. The proposal was supported by letters of endorsement by Boyle County Judge-Executive Harold McKinney, Danville Mayor Mike Perros, and Junction City Mayor Jim Douglas. The downtown Danville census tract (#21021930300) includes the area east of Norfolk Southern rail line; west of Maple Avenue; south of Lexington Avenue; west of Wilderness Road, Stanford Avenue, and Gose Pike; and north of Clark’s Run. The Kentucky Cabinet for Economic Development will oversee the program through the Kentucky Opportunity Zone Initiative. More information, including maps of the Opportunity Zones, is available and will be updated on the initiative’s website, www.KyOZ.org. Develop Danville, Inc., is the marketing identity of the Danville-Boyle County Economic Development Partnership (Partnership), Inc. The Partnership is an alliance of the Boyle County Industrial Foundation, Danville-Boyle County Chamber of Commerce, Danville-Boyle County Convention & Visitors Bureau, Heart of Danville Main Street Program, Main Street Perryville, and the local governments of Boyle County, Kentucky, and Cities of Danville, Junction City, and Perryville. The Partnership communicates, collaborates, and coordinates the Partners’ interdependent economic development missions, resources, and initiatives to grow the economy of Boyle County. As a team, the Partners provide Boyle County, its communities, and its citizens with a cost-effective array of community and economic development services.